A recent spike in federal spending is an energizing opportunity for researchers, the nation’s top scientist said during a visit April 2 to the University of Florida. The National Institutes of Health’s 8.8 percent budget increase gives scientists a chance to be bold, to pursue disease cures more quickly and to take risks in pursuit of major scientific discoveries, said NIH Director Francis Collins, M.D. In fact, Collins said a cure for sickle cell anemia may not be far off. The disease affects blood flow by altering the shape of red blood cells. year, and the largest amount overall since 2003. 2,200 high-tech jobs and served more than 100 startup companies in biotechnology, biomedicine and bioagriculture. “There are very few universities that have had the kind of vision to make sure their discoveries get taken to that next step,” Collins said. NIH-funded research at UF has grown in recent years. Overall NIH research awards at UF were $161 million in the 2017 fiscal year, up from $141.8 million in 2016. At UF Health, the university’s academic health center, NIH research funding has grown for seven consecutive years, going from $87.5 million in fiscal year 2010 to $141.8 million in 2017. The event was organized by U.S. Rep. Ted Yoho, R-Gainesville, who along with UF President Kent Fuchs accompanied Collins to the tour of the Sid Martin Biotechnology Institute and who addressed the audience in the Harrell Building. generation of physicians and researchers. “Growth of NIH-funded grants increases the national stature of the University of Florida. It also creates thousands of jobs in our local community. Biomedical research is a powerful economic engine for our community,” Guzick said. 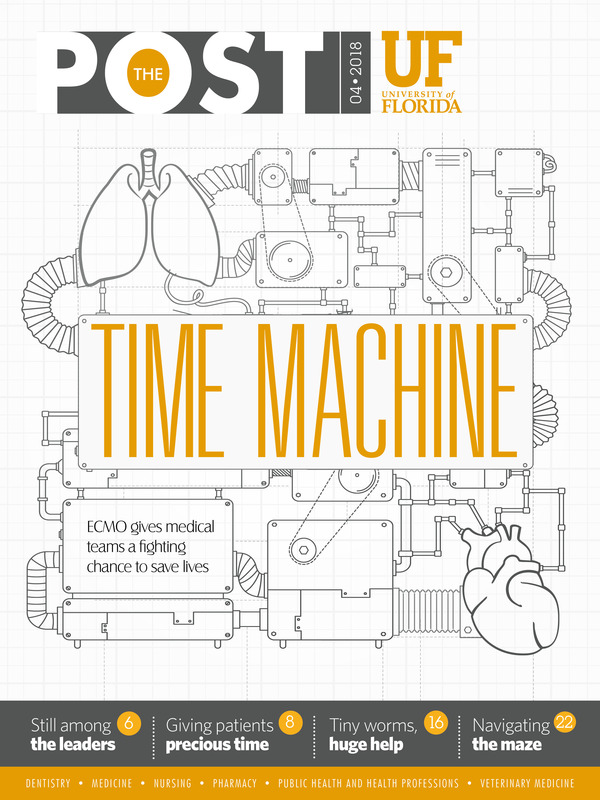 sciences research, said Michael L. Good, M.D., dean of the UF College of Medicine. recent faculty hired through preeminence initiatives meant to boost UF’s research and academic standings. accelerates the process of transforming scientific discoveries into improved health care. 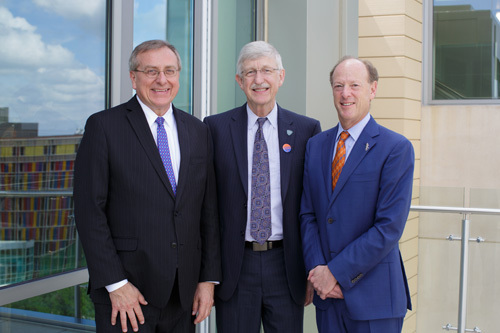 Good said notable examples of NIH-funded work at UF include first-inhuman clinical trials of cancer immunology to treat brain tumors, discovering the genetic underpinnings of neurodegenerative diseases such as Lou Gehrig’s disease and important research on inherited muscle diseases.